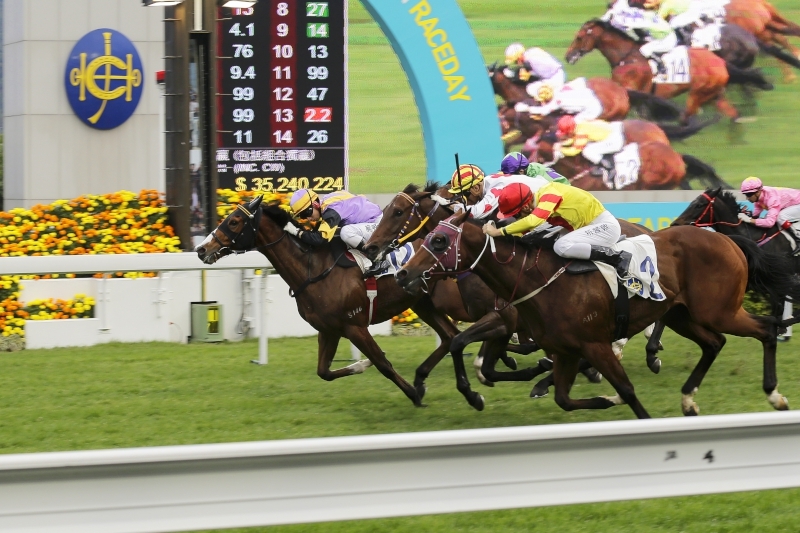 Hong Kong’s three-race Four-Year-Old Classic Series is almost upon us, and at Sha Tin tomorrow (Saturday, 14 January) a clutch of this year’s rising generation will attempt to find traction on the road to the BMW Hong Kong Derby. My Darling is among them. My Darling scores a comfortable win at Sha Tin last time on 27 December. 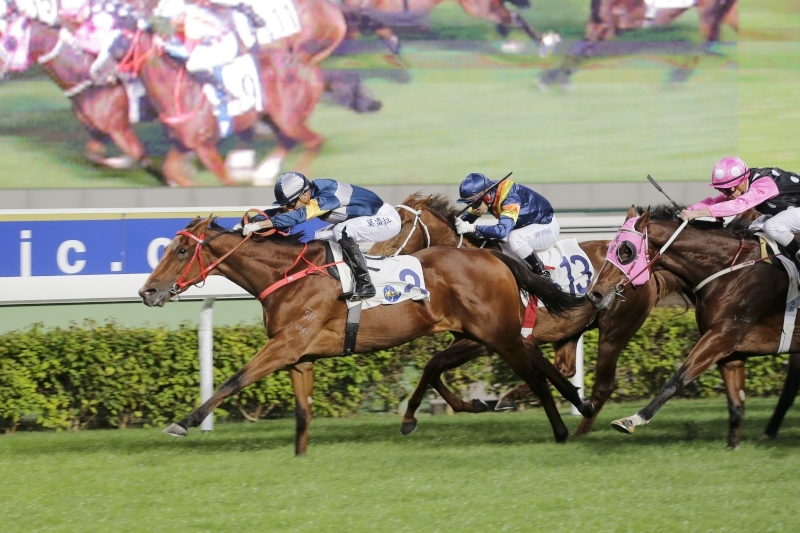 John Size’s charge will line up in the Class 2 Beas River Handicap (1400m) ahead of an anticipated assault on the series’ first leg, the Hong Kong Classic Mile, just eight days later. With four wins from seven Hong Kong starts and a rating of 91, the trainer believes the two-time course and distance winner needs to find an edge going in against some highly-rated opponents in a week’s time. “The plan is to run him this weekend and then go to the Classic Mile. I just wanted to make sure he’s had enough racing and is nice and solid going into the Classic Mile. He hasn’t got the rating to win the Classic Mile, so I thought maybe if he’s got a bit of a fitness edge it might help him get some prize money,” he said. And a good performance from My Darling (126lb) against the best of his peers could trigger a shot at the following month’s Hong Kong Classic Cup (1800m), and perhaps the Derby (2000m) itself in March. The Holy Grail of Hong Kong racing might seem a stretch for a horse that has not yet stepped beyond 1400m, but there is stamina in the family. My Darling’s dam, the Golan mare Syrian Bride, is a full-sister to a G1 Victoria Derby (2500m) winner in Kibbutz. “I think we’ll learn a little bit more tomorrow and again in the Classic Mile,” Size said. “His mother is a sister to a Derby winner, so it’s not impossible that he’ll stay that distance. And his sire, Mossman, did win at 10 furlongs, even though he looks like a sprinting sire and has sired a Golden Slipper winner - so it’s a little bit of a stretch but I’m not convinced that he can’t run further. There is somewhat of a little query on it and we’ll learn something more in the Mile next week. “There have been horses that have looked like strictly sprinters and they have done well in this series because, against their own age at set weights, their higher rating - their class - offsets the stamina,” he continued. Joao Moreira has ridden My Darling in all but his debut race when Brett Prebble was the man in the hot seat. Prebble is booked to renew that partnership tomorrow as Moreira will team up with the John Moore-trained five-year-old Invincible Dragon (124lb) in the same race. “John (Size) wanted a rider for My Darling who could commit to riding that horse in the Classic Mile, too, and when he put the horse in this race I had already committed to ride Invincible Dragon, so I couldn’t commit to ride My Darling in both races,” Moreira explained. 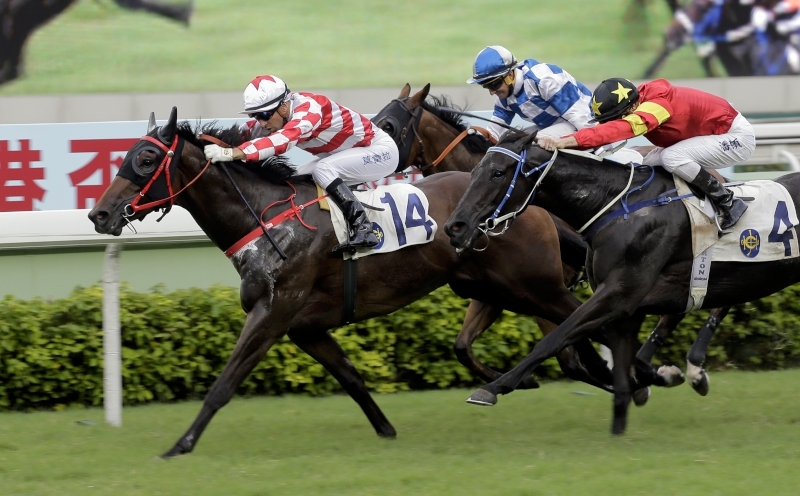 Invincible Dragon flashed home on his season’s return over 1200m at Sha Tin on 1 January. The bay, a mile Listed winner when raced as Arctic Gyr for Andre Fabre in France, stormed through the final 400m to clock a race-fastest closing split of 22.27s and finish second behind stablemate Midnight Rattler. Another Derby aspirant and Classic Mile possible in the 14-runner contest is the Moore-trained Let Us Win (122lb). The Sebring gelding won the G2 Phar Lap Stakes (1500m) last March when raced as Hattori Hanzo in Australia and caught the eye on his Hong Kong debut. The gelding hit trouble at the top of the stretch in a Class 2 1200m contest on 11 December, leaving jockey Hugh Bowman little option but to allow his mount to roll home untested in 10th behind Mr Stunning. 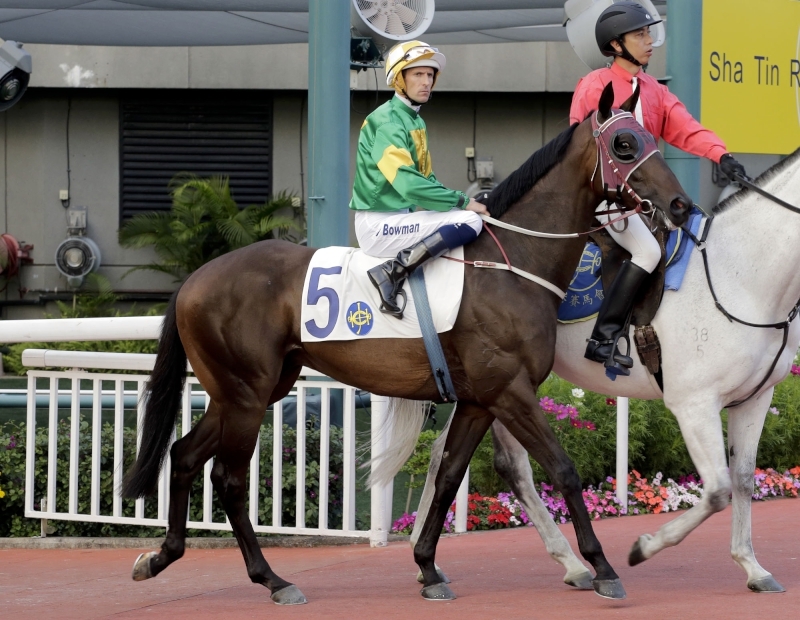 Let Us Win was an unfortunate 10th under Hugh Bowman on his Hong Kong debut last month. Sam Clipperton will take the reins in tomorrow afternoon’s finale. The young Australian hoop partnered Let Us Win in a gallop on Thursday morning when the gelding clocked 53.7s (28.9, 24.8) for 800m. “Let Us Win’s a nice horse, he’s got good form in Australia but he’s probably a little bit more untapped here at the moment than some of the others - he’s one that could fly under the radar,” Clipperton said of the horse that has worked in company with stable stars Not Listenin’tome, Helene Paragon and Able Friend in recent weeks. Fellow four-year-old New Asia Sunrise (129lb) is also in the competitive line-up, as is the debuting Derby entrant Dr Win Win (118lb) alongside talented gallopers such as Jolly Banner (133lb), Super Lifeline (128lb) and Team Fortune (122lb). In Saturday’s trophy race, the Class 3 Pearce Memorial Challenge Cup Handicap (1800m), Clipperton will ride another member of the Moore stable’s strong four-year-old battalion, Booming Delight (129lb). Booming Delight (in yellow) runs a gallant second in a Class 3 mile handicap on the New Year’s Day. The Hong Kong Derby entrant also holds a ticket to next week’s Classic Mile but will first step up to 1800m, having started his Hong Kong career with two smart efforts in defeat. The British import, sixth in last year’s Britannia (1600m) at Royal Ascot for William Haggas when known as Out And About, failed by only a short-head in a mile handicap at Sha Tin last time, with Clipperton in the plate. “I think stepping up to 1800 is going to be a big key and drawing barrier one will also help me just to give him a lovely run with some nice bit of cover,” the jockey said. Booming Delight sported blinkers in his last two races but the headgear is being discarded this time. “He was drawn wide in 12 and just overdid it a little bit over 1600 metres last start. He still got home very well and had a massive turn-of-foot but I thought it was important to take the blinkers off stepping up to 1800 metres, just to help him to settle and produce that turn-of-foot,” Clipperton said. Others in the 14-strong line-up with BMW Hong Kong Derby entries are Prawn Baba (133lb), Whoop Whoop (123lb) and Mambo Rock (116lb). One four-year-old with potential but not on the Classic Series trail is the Size-trained Dr Listening. The 68-rated Star Witness gelding kicked off his career with two wins from three starts last term but failed to fire on his return to action at the start of October, finishing 12th when 1.7 favourite for a Class 3 over 1400m. Dr Listening notches his second career win on his final start of last season back in July. Dr Listening was found to be slightly lame in his off fore after that race and was restricted to swimming and trotting before returning to trackwork a week and a half later. The bay will drop back to 1200m for his first race since, in the Class 3 Long Valley Handicap, race five on Saturday’s 10-race card. “He got away a little bit after that slight setback, he was a little bit gross when I started to trial him, so in the short time that he had off, he got away from me too much - he did too well,” said Size, who has given the horse four barrier trials in the interim. Moreira has ridden the horse in its last two races and will be up top again this weekend. “His head carriage is awkward, so he’s not an easy horse to ride, but I believe his fitness is good enough for this race and his preparation has been better this time than last time. In time, I think he will go further but for now 1200 metres is ok for him,” he said.